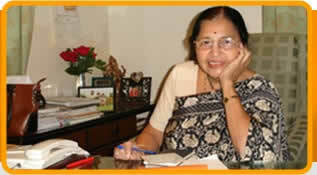 Dr. Usha Krishna was born in Mumbai in a family of educationists. Her father was a pioneer in education, educated in London in 1920’s. He setup the first co-educational school with tremendous importance to art, music and extra curricular activities. Her mother was one of the first few ladies to go abroad in 1930s to learn child psychology and Montessori education. Dr. Usha Krishna therefore had an ideal environment to study as well as have all round growth in various facets. She paid great deal of attention to music and dancing along with her medical studies and even today she is very much interested in performing arts and paintings. She was a trustee of New Era School trust which has been now been passed on to a very capable resourceful group. She has married to Mr. G Ramakrishna to an Industrial Engineer and Management Consultant. He has been a source of great strength and helped and inspired her to work. Her son Anand Krishna an Industrial Engineer and MBA married to Sonali who is MBA and CFA. They work in USA and have two daughters. Her daughter Dr. Amala Mahadevan and her husband Dr. L Mahadevan are in academic fields after their PhDs in Stanford University are now professors in Boston University and Harvard University respectively. They have a daughter and a son doing very well in USA, but regularly come to India to learn a lot. The family has been a great source of joy. After her post graduation, she was trained in High Risk Pregnancy problems abroad and joined KEM hospital as Asst. Hon. and later she was Hon. Prof. in KEM hospital and GS Medical College. She was extremely interested in teaching and was in-charge of Dr. N A Purandare Ob/Gyn. research centre. She is a post graduate teacher and examiner for MD, DGO, DNB, PhD. She has conducted many teaching programmes for the Universities, ICMR, College of Surgeons and Physicians, ICOG. She is reviewer of several journals. She is very grateful to her mentors such as Dr. B N Purandare, Dr. V N Purandare, Dr. Banoo Coyaji, Prof. U K Sheth, Prof. Ranjit Roy Chaudhury, Dr. Mrs. Fernandes, Father Fuster and many other well wishers and colleagues who inspired her to do the medical, operative, research work, as well as community welfare. There is much more to be done in every field yet. She had WHO grants, especially on projects related to fertility control. She was on the Prostaglandin task force and was closely associated with work of WHO Fertility control projects and as well as projects of Indian Council of Medical Research. She was the Chairperson of the FOGSI Committee of Adolescent Problems and Clinical Research and later the President of FOGSI and Mumbai Ob/Gyn. Society. She was a member of expert committee for clinical research and Family Welfare at Ministry of Health, Government of India. She is a chairperson of scientific advisory committee – Reproductive Health; ICMR She is also a member of advisory council, Population Foundation of India and on scientific advisory committee of National Institute for Research in Reproduction, ICMR, Sir H. N. Hospital, Breach Candy Hospital and KEM Hospital, Pune. She was on FIGO expert advisory panel on Maternal & Perinatal Healthcare. She was the Chairperson on Ethics committee of National Institute of Research in Reproductive Health and now chairs ethics committee of Tata Memorial Hospital. She is greatly interested in setting up medical clinics of excellent quality. As a medical & welfare advisor of Larsen & Toubro, she has set up number of centers which have received recognition from BMC & BCC, Mother Teresa award etc. She is a trustee of L & T Charitable trust. Dr. Usha Krishna is closely associated with FPAI for more than a decade. She is the President of FPAI, Mumbai branch and now also the President of FPA India. She is the Vice Chairperson of the medical advisory committee. She has organized conferences and seminars on the subjects related to ob/gyn, family welfare and community health. Her professional work is related to clinical work, academics and research as well as publication of scientific material. She actively works for India Sponsorship Committee which runs by Balgram – Children’s Village for orphan children. The institution has a school upto 10th standard and vocational training institute. She has edited of books on Pregnancy at Risk, Safe Motherhood, The Adolescent Girl and Maternal Mortality and High Risk Pregnancy. She has 152 publications in professional journals, 20 chapters in books and has started FOGSI Focus, an educational publication of FOGSI and contributed 10 to 11 of them. She is the series editor of “Obstetrics and Gynecology in Perspective” of Orient Longman. She has been invited to speak at several conferences and universities. She is keen to reach knowledge and she is highly motivated to spread the message to achieve the excellence and high performance through team work. She is involved in many activities from patient care, teaching as well as social welfare and cultural activities. She hopes to continue her mission to spread happiness through health.